Business Model You, a book from Tim Clark, has the subtitle “a one-page method for reinventing your career“. The personal business model canvas is the central model of the book, which is based upon the Business Model Canvas. Tim Clark provides a four-stage methodology to innovate your personal business model (canvas) and provides lots of practical examples in the book. So let’s have a look at the overall structure of the book, deep-dive into the personal business model canvas and zoom-in on the business model you methodology. Tim Clark provides a great set of tools and models to help you find out who you are and what your career purpose is. Tim Clark starts with the wheel of life exercise, and triggers you to find out the multiple roles that you play in everyday life. Each role has in theory its own personal business model canvas. From the common denominators from your roles you can plot the lifeline discovery and find the career sweet spot on the intersection of interests, skills and abilities & your personality. I was fortunate to go through a similar set of investigations during a two-day workshop “het talentenspel” as part of the Next Generation Consultant traineeship at Microsoft. The outcome and self-awareness is a very valuable asset during your professional life. Also check-out the article: Peter F. Drucker – Managing Oneself (Havard Business Review) that I wrote a while ago. Tim Clark forces you to alter the perspective on one or more of the personal business model canvases. You will start making new prototypes of that personal business model canvas based on some hypothesis. In the last section you will need to test these hypothesis and new personal business model as quickly as possible. A Preview of Business Model You! can be downloaded from the Business Model You! Community page or the Venterprise website. 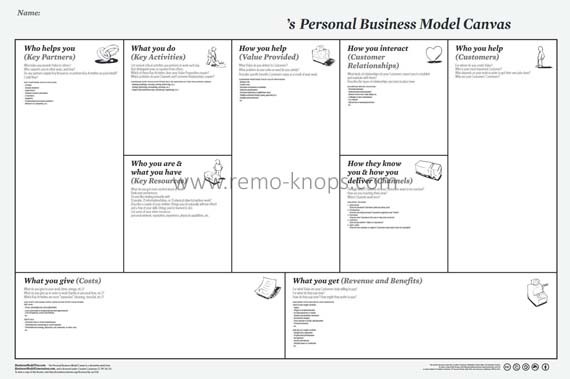 The Personal Business Model Canvas is adapted from Alexander Osterwalder’s Business Model Canvas that was part of the bestseller Business Model Generation. Tim Clark was part of the Business Model Generation book team, and in the “How it Started” section of the Business Model You Community you can read how the Personal Business Model Canvas evolved. Tim Clark describes how to use the Personal Business Model Canvas in the 10-minute video above. On the Business Model You community page you can find an editable Personal Business Model Canvas PowerPoint template or you can download the PDF version below. Patrick van der Pijl, co-author of Design a Better Business, and part of the Business Model Generation book team published an excellent SlideShare: “The Business Model is You!” that perfectly explains the Business Model You methodology with practical examples. First you define your (often implicit) personal business model by drawing it on the Personal Business Model Canvas. Second you reflect on the current personal business model and envision new possibilities. Than in the third phase you rework your personal business model, based on the reflection and new possibilities. Finally you quickly act by testing your new personal business model and start over with reflecting, revising and acting. Business Model You! is an excellent resource that you can use during your recurring personal development- and appraisal cycles. Especially the reflect section is a highly important section that will provide you with valuable information for the rest of your professional career. Understanding your wheel of life, the multiple roles that you play and knowing from which building blocks your career purpose is build-up is extremely valuable. Business Model You is a work-book, where theory is explained based on persona’s that can be placed in a simple practical context. The current Business Model You price-point is about $ 18,– which is very reasonable. You don’t just buy the book, but there is also a very active Business Model You Community that brings a lot of value. Don’t forget to go through the extensive video section of the Business Model You Community where you can view Tim Clark presenting at TEDx: Career planning is dead — and career modeling rules. You can’t go wrong with a valuable personal and professional development workbook like Business Model You. I used the Personal Business Model Canvas during my latest (self)appraisal process, when I found this article: Can a Personal Business Model be combined with an Organizational Business Model ? 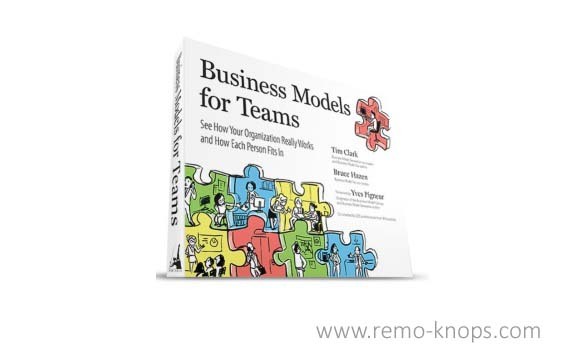 Is there a fit between your personal business model, the personal business models of your team-members and your firm’s business model. Interesting questions to think about and I’m already working through the preview of Business Models for teams. Hey!, I found this information for you: "Business Model You – Tim Clark". 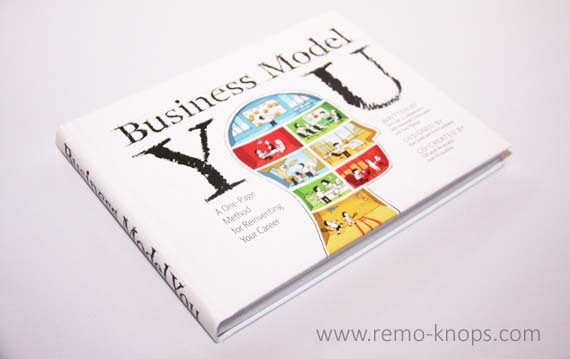 Here is the website link: https://www.remo-knops.com/3679/business-model-you-book-review-tim-clark/. Thank you.